This truly was a game of two halves, a bold Blackpool took full advantage of an error strewn Manchester United before two well judged and well-timed substitutions from Alex Ferguson swung the game in the second half. 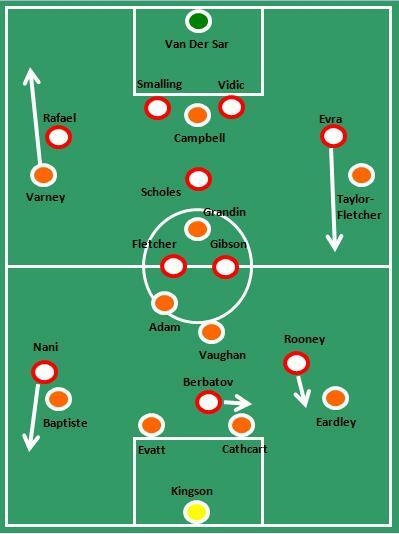 4-3-3 v 4-3-3 but applied differently as Blackpool advanced Grandin, whilst Manchester United withdrew Scholes in to a deeper role. The formations at the start of the game saw 4-3-3 go up against 4-3-3. 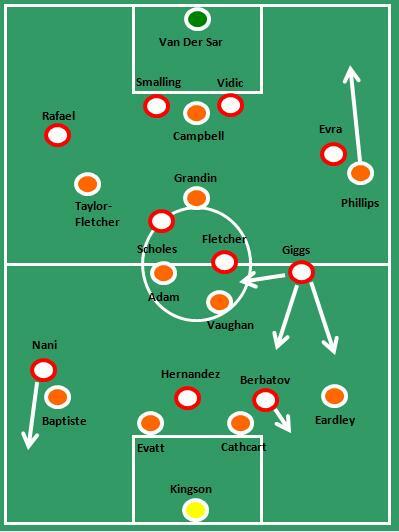 The key being that they were applied slightly differently as Blackpool pushed Elliot Grandin up in to his advanced role while Manchester United pulled Paul Scholes deep to sit and hold in front of the defensive line. The fact that out of possession Grandin didn’t always drop back in to a three often gave Man Utd a spare man in midfield which explains their overall dominance on the ball (429 completed passes to 287). However, errors by Man Utd were rife in the first half and Ferguson appeared unhappy with Rooney being kept quiet out wide left and midway through the first half he opted for his first formation shift. Ferguson went to a 4-4-2 to try to shake things up, moving Darron Gibson out to the left and bringing Wayne Rooney in centrally. In shifting to a 4-4-2 Ferguson tried to accommodate the two players that didn’t have the best of games. Needless to say that the 4-4-2 made no difference in the first half except to afford more space to Blackpool who used it well and could have extended their lead. The second half saw Ferguson shift back to a 4-3-3 but given the free role assigned to Ryan Giggs the formation had a staggered feel to it as Giggs shuttled inside, outside, backwards and forwards. Ryan Giggs was applied to the 4-3-3 in a slightly more flexible way and found space easy in a free role. 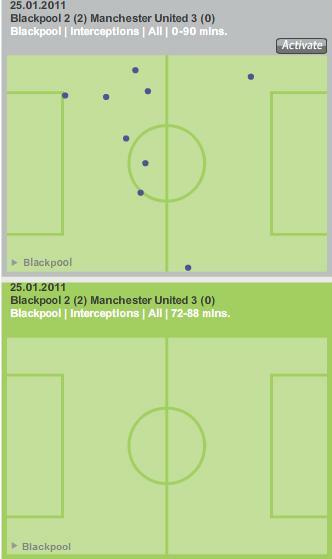 As Blackpool possession broke down Man Utd more often than not had a spare man as Elliot Grandin wasn’t dropping back quick enough. This spare man was Paul Scholes and he knitted the formation together with some great passing ability (see below). In truth Man Utd’s 4-3-3 became more fluid with the running and movement of both Giggs and Hernandez away from the static nature of their 4-3-3 whilst Rooney and Gibson were on the pitch. Man Utd found a rhythm in the second half and their passing and movement meant Blackpool were over run and couldn’t get near to Man Utd as they scored 3 goals in a 16 minute period. Look at the chalkboard for Blackpool’s interceptions for the whole match compared against them in that 20 minute spell where the lead was lost. As Man Utd applied their 4-3-3 in a more dynamic fashion and the passing and movement moved up a level Blackpool struggled to break up their plays. While the hype has been about Charlie Adam this week and the way that he pulls the strings for Blackpool with his superb passing range, on the night there was only one player on the pitch who dominated. 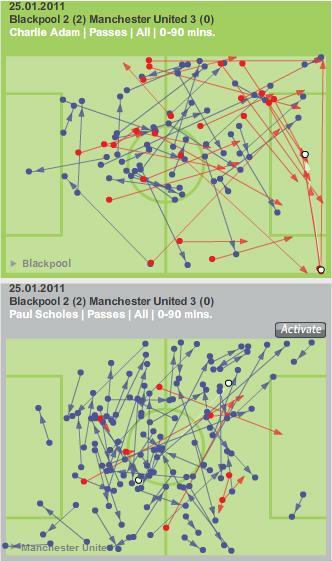 Paul Scholes was composed in possession, making the right decisions at the right times and barely wasting a pass. Added to this he broke forward when he sensed the opportunity was there. Wherever Adam finishes his season he will surely look to learn from a midfielder like Scholes in order to adapt his game for certain occasions and when to spread play and when to keep things simple. See below and compare the passing chalkboards for the two players Scholes completed 88% of his passes whilst Adam was down at 55%. Efficient in possession and deadly at the right times - Scholes. Dangerous sporadically, but less efficient as he forced things to happen - Adam. After the Rafael head injury it appeared that Holloway knew Man United were in the ascendancy and tried to change things through personnel switches. He pulled Matty Phillips to right back, Eardley went to left back, Alex Baptiste went in to midfield and Grandin took up a forward position. Praise to Holloway for attempting to change the game in this way, but in truth it couldn’t stem the tide against a rampant Man U.
Ferguson appeared to have one element of his game plan that he stuck to which was apparent from the kick off, but only bore fruit in the second half. This was to target Blackpool’s right back position (not necessarily Neil Eardley) possibly backed up by Sunderland’s success in that area. Berbatov constantly peeled off in to that area when Man U had possession and Wayne Rooney stepped up to try to overload Eardley as Man U searched for early and quick ball in to that area. In the first half a mixture of good defending and woeful ball control and interplay by Man U meant that nothing was achieved via this route. However, the movement of Giggs in combination with Berbatov penetrated this area at will in the second half and combined with excellent central movement from Javier Hernandez meant that Blackpool were exposed on their right flank all too often and the defensive line were left static by the perpetual movement of Hernandez. 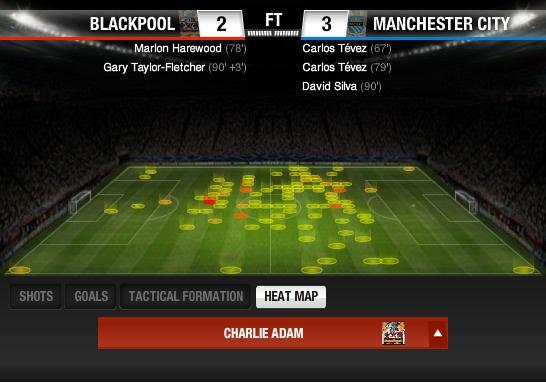 Man Utd seemed intent on overloading the Blackpool right back area. Passes gravitated there and player movement centred in that area. It was a brave performance from Blackpool who will remember the 2-0 half time lead for years to come, but Ferguson had great quality on his bench and used it to devastating effect to make his starting 4-3-3 much more dynamic. Ian Holloway will now turn his attention to the next two matches and try to get Blackpool picking up some points to help them towards the ‘unachievable’ dream! Simon says, 'put your hands on your head if you can land it on a sixpence from 50 yards'. 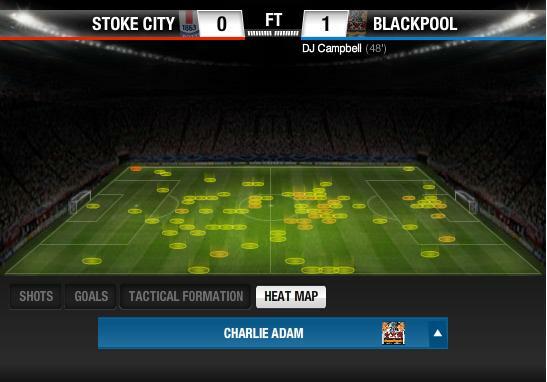 There’s no doubt that when people refer to Blackpool this season they normally mention Charlie Adam in the same breath. He has adapted to life in the Premier League and made many people sit up and take notice. 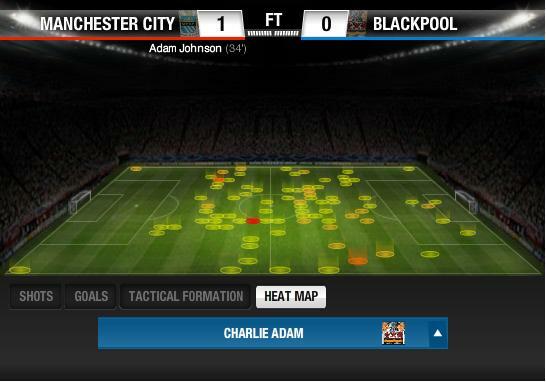 However, where does Adam fit in the Blackpool FC and just was does he bring to the team? Keeping things brief on this front as the table below will cover most of the key stats, but far and away the first stat to catch the eye is Adam’s passing. Blackpool as a team have a pass completion of 75% and Adam has a lower one than the team coming in at 71%. However, given that Adam is the main set piece taker then the open play pass completion percentage may hold more relevance to his overall play. In open play he finds his team mates 74% of the time against a team average of 78%. Again he comes in lower than the team average, but assuming Holloway has assigned him the role of playmaker then he is likely to mis-place passes as he looks for the killer ball. What is clear when looking at his stats for the season is how much he contributes elsewhere and this is typical of the player he is and the flexibility that Holloway has instilled in the team. 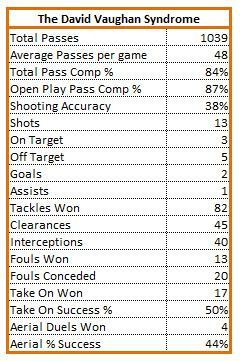 There’s no room in the Blackpool squad for one-dimensional footballers (and arguably no place for them any more in the modern game) and he chips in winning tackles (83) and intercepting opposition moves (41) which are duties normally associated with a more defensive minded midfielder. Extracted from Guardian chalkboards and Telegraph stats. When you look at the table above there is one of those numbers that start to show the true worth of Adam to Blackpool this season. That is the key passes totalling 36, the next highest Blackpool player is Gary Taylor-Fletcher with 27 and ranks Adam 13th in the Premier League. What this does is to back up the assertion that Georgina Turner made in her excellent article about Adam in that, ‘he has set countless Blackpool moves in motion with a well-timed drop of the shoulder and a deft flick of his left foot’. Now the stats have been laid bare, what about the space that he occupies on the pitch. All those stats occur for a reason and that is they happen within that space and to understand that space can help to understand some of the variation in success that Adam has had this season. By no means has Adam been perfect and with his work rate comes a desire to improve and success. He’d possibly be first to admit that there are times this season where he has failed to break defences down or command more authority in the middle of the pitch. These following four games give good examples of where Adam operates best from Blackpool’s perspective and where the opposition are best to keep him in order to keep him quiet. 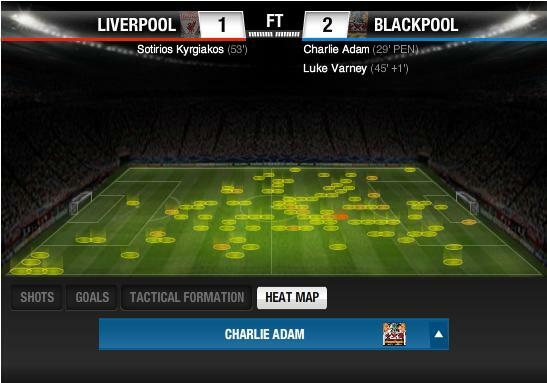 In the first game against Liverpool this season, Adam was at the heart of a magnificent performance from Blackpool underpinning some wonderfully positive passing moves. 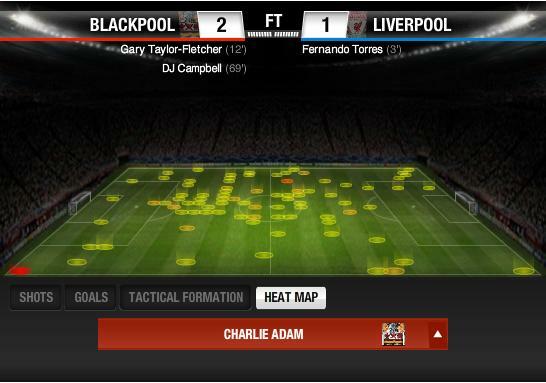 On the day Liverpool were very static in the first half and Blackpool worked between their lines with ease. 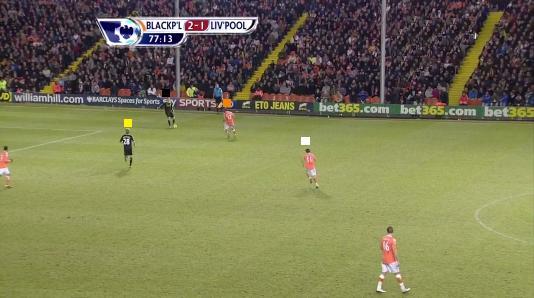 In midfield Liverpool tended to allow Adam as much space as he wanted. Whether this was ignorance from Roy Hodgson or not isn’t clear, but it happened. As you can see below Adam spread himself far and wide and made it in the Liverpool box at times. He got forward well and found space in the final third in order to operate. 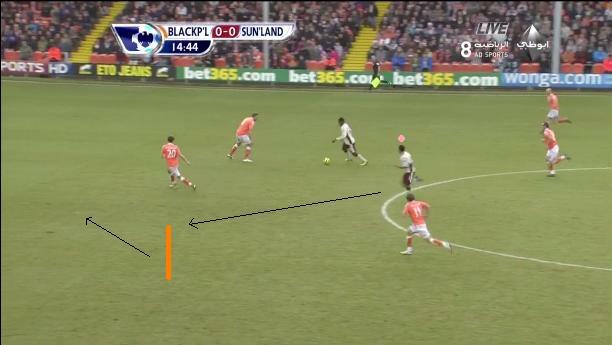 Above Blackpool are attacking right to left. When Liverpool came to Bloomfield Road the other week it appeared that Liverpool (albeit under new management) still hadn’t come to terms with Adam endeavouring to find space. They coped with him better and as mentioned in the review they did field a similar three-man midfield to Blackpool. 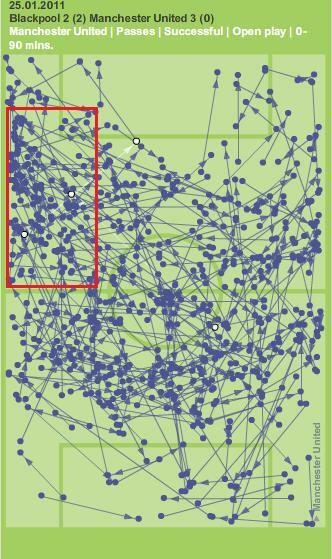 However, with Christian Poulsen proving to be rather inert Adam was still able to find space and time to find his passing range. Below you can see that he is still allowed to get in the box and the final third even given the different Liverpool approach. Above Blackpool attacking from left to right. The Liverpool matches in isolation may not show the positions where Adam is dangerous, but given he was at the heart of both victories a look at another match set might show where to keep him. The home game against Man City saw Adam earn rave reviews from Sky Sports pundits (not sure what qualification that is?) but it saw Blackpool go down to a 3-2 defeat. Ultimately the game was highly influenced by the majestic David Silva ghosting around the pitch and cutting deeply through the Blackpool defence with his vision and passing ability. However, it appears that City were all too aware of letting Adam get free and in to space and close to goal. Aware of his passing ability and propensity to shoot on sight you can see below how his heat map is considerably more constricted than that of the Liverpool games. There is little activity in the final third as Man City were content to let Adam have the ball in deeper areas. In the return at Eastlands it appeared that Man City had the measure of Adam. Keep him deep and he is less of a threat. However, it is important to note that Roberto Mancini has an emphasis on a holding midfielder and in this match Nigel de Jong was excellent in killing the space that Adam likes to attack and something akin to what Poulsen should have done for Liverpool at Bloomfield. You can see below just how little of the final third Adam was seeing in that match. Above Blackpool attacking from right to left. This is most probably nothing new for most people, but hopefully it shows that given space, time and less attention then Adam can advance in to his favourite areas and should that happen then it becomes more likely he’ll hurt teams. 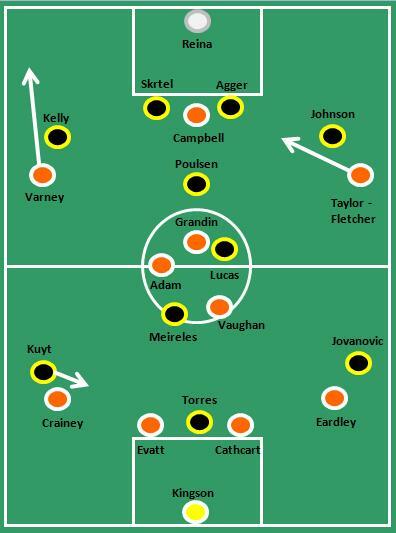 In the away match against Stoke he worked between Stoke’s rather static 4-4-2, found space and again was central to all the good things that happened for Blackpool that day. Contrast his heat map below to that from the Man City game above. 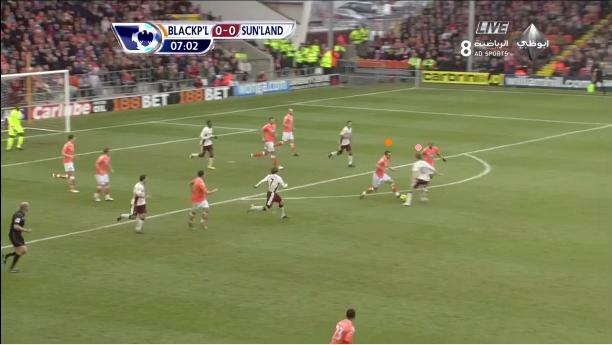 You can clear see how much more he gets in the final third and on that day was key to the DJ Campbell winning goal. It’s pretty clear and logical that the closer teams allow Adam to get to their goal with time on the ball the more threatening he is and given that Blackpool tend to struggle against teams covering the space in front of defence with a holding midfielder suggest that might be the way to stifle him. However, given his passing range from deep and Adam’s desire to develop, then it wouldn’t be surprising to see him adjust his game to become a threat from the deep. Just to illustrate one final time, look at the chalkboards below, one from the Stoke game and one from the Man City (away) game. Adam opens up the Stoke defence who lined up in a flat 4-4-2 affording him space. 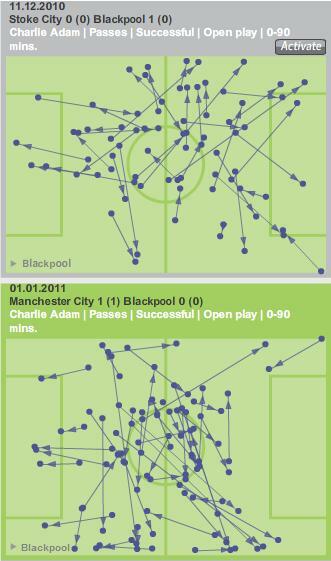 Compare that to the lower one where Man City closed out the space that Adam thrives in. What’s not in the stats? Following on from that his passing range is something that cannot be unlocked through the stats above. His range is superb and a look at Up the ‘Pool’s recent article on the long diagonal pass goes someway to illustrate his range of passing. However, added to that range is his speed of thought, passes of long or short-range aren’t ‘eyed’ up or pondered over. They are swiftly clipped with either inside or outside of the boot giving little or no advance warning to the opposition as to where the ball will end up. The downside of this is that his team mates aren’t often able to judge and should he step up to a more high-profile team then perhaps players of a supposed higher standard might read him at the same speed as he makes his mind up. Added to this there are the unquantifiable aspects of his character that bristle when he takes to the pitch. He has a free spirit on the turf allied to a steely drive and determination that emanates in strong attacking runs or fully committed tackles. On this blog the ideas and theories behind Blackpool’s three-man midfield have been discussed in length and this is crucial to understanding Adam. Adam must be considered in terms of Blackpool and the system that they play, he is surrounded by hard-working and equally excellent players who provide him with the ball and receive his passes and finish off the team moves. Adam’s performances are facilitated by those around him and none more so that David Vaughan. Before looking deeper at Vaughan a mention needs to go out to the role that Elliot Grandin plays in freeing up space for Adam to attack. Earlier in the season it wasn’t entirely clear what role Holloway wanted him to play, however, as the season has progressed it appears that Grandin has a brief to drift to the flanks, initially looking composed on the ball, but its the space he leaves behind which is key. By drifting to the flanks he leaves a vacancy behind that Adam can fill. David Vaughan was brought to the club as a left back, left winger before Ian Holloway arrived and when it became clear that Holloway had secured the signing of Adam it appears that Holloway had done his study on the best way to get the most out of Adam. Adam signed on loan in the February of 2009 under Tony Parkes. Adam fizzed and dazzled in fits and starts during his 13 match loan spell, earning a red card on debut for a clash with former Bloomfield favourite Richie Wellens in a match against Doncaster. What this loan spell tended to show is that in a two man midfield Adam could be dominated by hard working opponents, Blackpool won 4 games of that 13 game spell. What Holloway knew was that to get the best of Adam and free him up he had to field him in a three man midfield. It’s a bit chicken and egg whether or not Adam inspired the 4-3-3 or Holloway was going to play that way anyway. The man Holloway appears to have assigned as the man to free Adam up was David Vaughan. Keith Southern was in there, but he is full of energy and bustle and not nearly so composed on the ball. 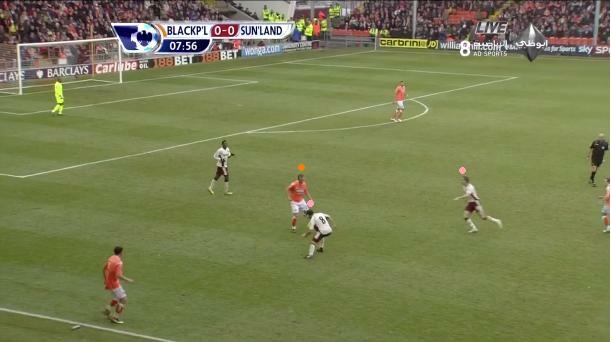 Holloway knew he had to have a passer of the ball in next to Adam in combination with the energy of Southern. The midfield this season have evolved further and become more cultured, but the role of Vaughan has changed as well. He sits more, he breaks the play up, he is both breaker up of opposition play and setter of tempo. Look at Vaughan’s stats below to see what he contributes to the team. What the stats show is that Vaughan averages about 10 passes per game less than Adam, but is more efficient with his passing, achieving 87% with his pass completion. This is measurable against other players who are playing in a slightly withdrawn role i.e. Chelsea’s Jon Obi Mikel has clocked up a pass completion of 89%. Also, he also won 82 tackles at a success rate of 66% which helps to break up opposition play. Vaughan will also retain possession and allow Adam to move in to space. Vaughan is however, more static in movement given his role, but will set the tempo with passes to full back and centre backs before releasing to Adam. Hopefully what has been illustrated here is that although Adam is getting a lot of column inches David Vaughan is integral to that and he must be viewed in tandem with Adam. He shoots less and holds a lower profile, but teams who ignore Vaughan will leave themselves open to Blackpool dominance in the pass. Ian Holloway recently said that he’s working to ensure that Adam got a move to one of the country’s biggest clubs if he stuck with him for the rest of this season. The reason behind this is that Holloway feels Adam can still improve under him and by looking at his stats you can begin to see where he may look to improve him. First and foremost, his decision making could be refined, instead of looking for the killer ball, the simple lay off might be an option. Given his pass completion is lower than the team’s average and some way below that of Vaughan and other recognised ‘top’ Premier League midfielders (Paul Scholes weighs in with a pass completion of 90% and David Silva 83%) then he may strive to improve his decision making, rather than his passing ability. 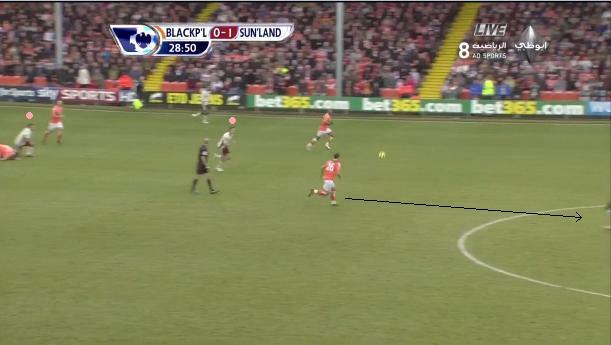 This would surely have a positive effect on Blackpool retaining possession more often. Added to this Adam loses more duels when taking on opposition players and again this might be something that he can work on, either to do so less or improve his ability to get past players. Given that on 28 occasions he loses out then that could be 28 passes to a team mate or any other positive option. Another statistic that Holloway may try to reduce is the number of shots that Adam has, again choosing the right time to shoot may improve his all round game. At the moment he has had 66 shots at goal, 15 finding their target and 3 hitting the back of the net, from penalties. Again, any improvement here will only serve Blackpool well and assist in them retaining Premier League status for another year. The King of Bloomfield Road?? It’s very likely that Charlie Adam will leave Bloomfield Road, but he will leave all Blackpool fans with memories to savour and linger for generations to come none more so than ‘that free kick’ at Wembley last May. Provided any future move is conducted with dignity and respect and the club get a respectable transfer fee then it will suit everyone. Adam will get his chance to shine on an even bigger stage and Blackpool will live on and stronger for having Adam grace the turf at Bloomfield. Blackpool’s use of the long diagonal has been a key tactic during the tenure of Ian Holloway, but until recently has garnered little attention. Pundits and fans alike have firmly pigeon-holed the Seasiders as a passing side, with neat, short passing a main ingredient in the success of Holloway’s team. What has been overlooked is the often direct nature of Blackpool when attacking, but this is anything but traditional long ball football. Since taking over at Bloomfield Road, Holloway has strictly relied on variations of the 4-3-3 formation. As a Championship side, Blackpool played a rigid 4-3-3, but this has evolved during 2010/11 into a more fluid 4-2-1-3, Elliot Grandin often being the man to occupy the advanced midfield role. Where Blackpool are almost unique is how they utilise the three forward players. In the majority of 4-3-3 variants, the two wide forwards nearly always drop back when defending to form a solid 4-5-1. Not so at Blackpool. Following the recent 2-1 home win over Liverpool, Holloway spoke in his post-match interviews about how he believed “width is the future”. The use of long, sweeping diagonal balls out to the two wide front players allows ‘Pool to stretch the play the whole width of the pitch. In doing so the front three retain a much more advanced position than in many other 4-3-3 variants. Before we get into the crux of this article however, we must first examine what constitutes a long diagonal. What is a Long Diagonal? There are two conditions which are not so easy to clarify however – the length of the pass and the angle of the diagonal. Referring to the angle of the pass, I have tried to focus on passes between 280° and 350° for passes to the left flank, and passes between 10° and 80° for passes to the right flank. It is hard to be specific about what length of pass I have used as the cut off mark, as this has been done on a visual basis, but I hope I’ve been consistent. When these long diagonal passes are made, it occurs to me that they can be broken down into two basic categories, which affect how the passage of play develops. I would label these as contested and uncontested diagonals. Let me explain this in diagram form. In a contested situation, the player on the end of the long diagonal receives the ball in close proximity to a defender. This prevents the attacker running forwards, but what Blackpool do so well in these scenarios, is surround the area with bodies pushing on from elsewhere. As soon as the long diagonal is launched, you will see the full-back, midfielders and central front player migrate towards the ball anticipating the second ball. Where Blackpool can be at their most exciting is in situations where the long diagonal is not contested by the opposing team. 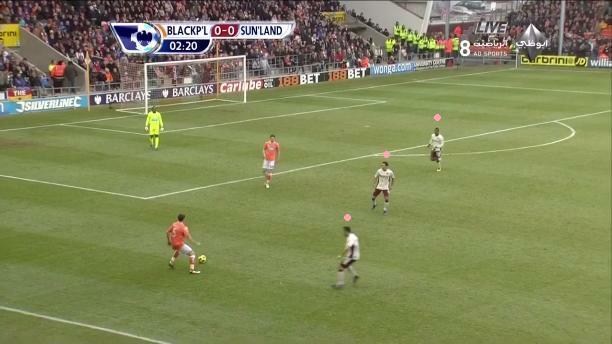 This is when a ‘Pool player receives the ball unmarked and drives towards goal. It is from these positions that the Seasiders attack with real pace and intent. This is where Holloway’s attacking ethos really shines, as the whole side move forward at once looking to get as many bodies in the box as quick as possible. We have now determined what a long diagonal is, and how Blackpool use them to their advantage, so it’s time we examine the figures – just how many long diagonals do ‘Pool make? In the 21 Premier League games so far this season, Blackpool have made 149 successful long diagonal passes, which works out at just over 7 per match. It might not seem like a particularly high figure when Blackpool can make 300+ successful passes per game, but this is a very specific type of pass which can often be defence-splitting. The long diagonal is a ball Holloway appears to encourage all of his players to attempt, but the table below shows exactly which players make most use of this tactic. Included in this table are all players who have successfully made 5 or more of these passes. Perhaps unsurprisingly Charlie Adam comes out on top, the number of successful long diagonals played by Adam dwarfing that of his teammates. On average Adam makes three successful long diagonals per match, three times the average of Ian Evatt and Dekel Keinan. It can be argued that David Vaughan has at the very least matched Adam’s performance levels this season, if not even eclipsed him slightly according to many Blackpool fans. However, when it comes to mixing up a range of passing, Adam is peerless. When Adam is given space, he will often look up to see if the long diagonal is an option. When Adam’s audacious passes come off they are worth the entrance fee alone, and I’ve compiled 10 of the best into the following animation. Some of them were so good they can even be appreciated in chalkboard form…if you’re a statistic-obsessed freak like me, that is. Vaughan’s range of passing tends to be somewhat shorter, as he looks to keep things simple, giving Adam the freedom to be more adventurous. Vaughan is sandwiched in the table by Evatt and his fellow centre-back Craig Cathcart. Evatt has completed the second highest number of long diagonals, averaging exactly one per game. Cathcart looks for this outlet less frequently, but still more often than the ‘Pool full-backs. Neal Eardley appears to have embraced this tactic more than Stephen Crainey, particularly in recent weeks with two successful long diagonals against both Birmingham and Liverpool. Crainey is much more reluctant to play the long diagonal, averaging roughly only one successful diagonal every three games. One man who unexpectedly made the above list is Dekel Keinan, who made six successful long diagonal passes, with only six appearances to his name – only Adam and Evatt can match or better his average. Keinan seems destined not to break through at Blackpool though, with a rumoured transfer window move to Cardiff on the cards, but it is a dimension of his game that could have been a useful attribute. A further nine players have made successful long diagonal passes at some point this season, albeit none have made more than than two. All of these players however are either fringe players or players who occupy a forward role – long diagonals are understandably hit from a deeper position and it cannot be expected for attackers to be making these types of passes on a regular basis. So now we know which players are comfortable with the tactic, but which areas are these diagonals hit towards? The table below tells all. It has been mentioned before (here on Zonal Marking and here on Tangerine Dreaming) that ‘Pool tend to attack more frequently down the left, and these statistics confirm this – 57% of the long diagonals played are hit towards the left wing. A tendency for Luke Varney to stick out wide more so than Gary Taylor-Fletcher is probably one reason for this, but the players responsible for the long diagonal passes must also be a factor in this. Neal Eardley’s long diagonals, for instance, will always be aimed towards the left flank, while Adam and Vaughan, both left-footed, prefer to pass in their natural direction. Blackpool’s left-sided bias will surely have been picked up on by opposing teams, and this could be another reason why Luke Varney has been less effective in recent weeks, as discussed in the review of the West Brom match. Now we know which players make the diagonals, and into which areas, but does it make a difference whether ‘Pool are home or away? In some ways the above statistics seem obvious, and in other ways unexpected – Blackpool average nearly nine successful diagonals per home match, dropping to just over six per away game. As the home side it should be natural for ‘Pool to be able to dictate the game, and enforce their own plans on the opposing side. Then again, on a pitch smaller than many other in the Premier League, creating the space for long diagonals is a much harder proposition. In the remaining away games, Holloway will undoubtedly seek to better utilise the space offered on the larger pitches away from home. In many ways this question should answer whether Holloway’s use of the long diagonal tactic is worthwhile. The following table makes for an intriguing read. Fascinatingly, the table indicates that the the more long balls played in a match, the less successful ‘Pool are. The Seasiders average 7.6 successful long diagonals in defeats, but only 6.5 in games which they won. However, let’s try to put this in context. On a small sample of 21 results, the difference between the win and loss averages of only 1.1 is negligible. One outlying result also heavily skews the numbers. In the 3-2 home defeat to Manchester City, ‘Pool successfully made an incredible 15 long diagonal passes, in a game they were extremely unlucky to lose. If this figure was taken out, the revised average would be only 6.6, roughly the same as the win average. Another point that should be taken into consideration here, is that metrics are notoriously hard to link to success in football compared to other sports, despite several people trying down the years. As covered by Jonathan Wilson in his excellent tactics bible Inverting the Pyramid, research carried out in the 1950s by a retired RAF Wing Commander advocated the long ball game, based on flawed statistics, showing that the majority of goals are scored following only three passes. As a result it was concluded that the ball should be worked from one end of the pitch to the other as soon as possible. Such theories have long been dispelled, and so it is no different here. It would be far too simplistic to reason that if Blackpool could increase the number of their long diagonals, it would directly lead to improved results. 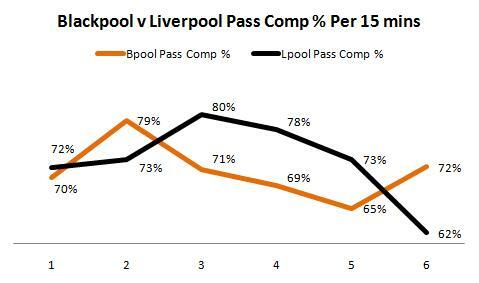 Rather it is about the quality of such passes, and in Blackpool’s case, mixing them up with clever short passing to test opponents in various ways. We have now determined in-depth how exactly ‘Pool use the long diagonal as part of their system, which players use the tactic most often, and how it ties in to success. Taking all of the above into consideration, we can pick out a couple of key observations. Adam’s value to the team has never been questioned, and he is in all senses of the word a talisman for the team. He is also key to providing a combination of short and long passing that continues to cause problems for Premier League defences. If Adam does move on, a significant aspect of ‘Pool’s tactical approach will be hampered. His existing under-study in the squad, Ludovic Sylvestre, has completed only two successful long diagonals in his six league appearances. It is unlikely Sylvestre can bring exactly what Adam does to the team, which may mean Holloway has to look to the transfer market for a like-for-like replacement. Given the left sided bias in the Seasiders’ attacks this season, Holloway should encourage his players to be more unpredictable by using the right flank more often. There are signs, however, that this is already beginning to happen. The emergence of Matt Phillips as a genuine option has seen ‘Pool use the right wing to a greater extent. For example, in the game at Eastlands where Phillips was introduced at half-time, six of the seven long diagonals that day were hit towards the right flank. As well as his pace, Phillips’ physical stature and fine first touch provides a better outlet for the long diagonal on this side of the pitch. 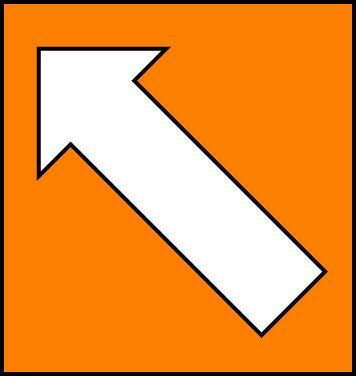 Away from the compact Bloomfield Road, Holloway’s side have been somewhat reluctant to make use of the long diagonal. Attacking on the counter into open spaces, the long diagonal could prove to be a potent weapon. However, the reduced usage of the long diagonal in away games could stem from a lack of freedom, and with less time on the ball it is more difficult to pick out the long diagonal. It is obviously a conscious tactic from Ian Holloway to implement the long diagonal, but success does not hinge on its use. Like any tactic in football, its effectiveness depends on a whole heap of other factors and quantity of long diagonals does not equate directly to points on the board, as the above table proves. The use of the long diagonal is something to keep an eye on as the season progresses, particularly if the worst does happen and Charlie Adam moves on this month. Blackpool are an open book when it comes to their attacking instincts, but the way they mix up their play with short and long passes is possibly one reason why the Seasiders haven’t yet been found out in the same way many other promoted teams sometimes are. At this point it would appear Ian Holloway’s best strategy for keeping Blackpool up is to carry on in the same vein, and as part of those tactics, that means the long diagonals ought to continue. Long live the long diagonal! By now everyone knows how this match panned out. Both sides made errors that were punished and West Brom claimed the 3 points. 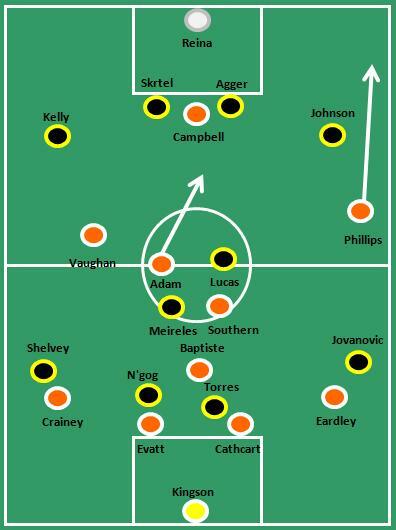 However, what went on from a formation point of view and how did that affect the match as the 90 minutes unfolded? Roberto Di Matteo uses a 4-1-4-1 which sometimes evolves into a 4-3-3 depending on the progressive approach of Jerome Thomas and Chris Brunt, whereas Ian Holloway favours his variant 4-3-3 that evolves in to a 4-2-3-1 or sometimes a 4-2-1-3. Blackpool with a deep defensive line, a tight and narrow midfield. Blackpool lead after 30 mins and as you can see above, the defensive line is sitting deep and the team in midfield are bunched close together closing out the space affording to the West Brom midfield. Whilst below you can see how West Brom played marginally higher up the pitch and resembled something more like a flat 4-4-2. WBA looking like a flat-ish 4-4-2 as Blackpool find space between their lines and create chances. Blackpool starting to spread and Vaughan being left behind as midfield moves up. As West Brom drew level Blackpool’s formation had started to spread wider than before and Taylor-Fletcher (number 12) has dropped back in to midfield. On the other hand West Brom have got marginally more adventurous with Marek Cech (4) pushing higher up. However, in midfield Youssuf Mulumbu (21) has started to move deeper and Chris Brunt has moved inside more, presumably to assist his colleagues in midfield. 11 sitting in narrow to add to midfield as 14 begins to stretch the play and 21 starts to drift deeper as a 4-1-3-2 emerges. Blackpool formed compact, but again with a gap between defence and midfield. At half time Blackpool are the more compact of the two team whilst West Brom have their defence playing slightly higher and the whole team almost spread box to box. 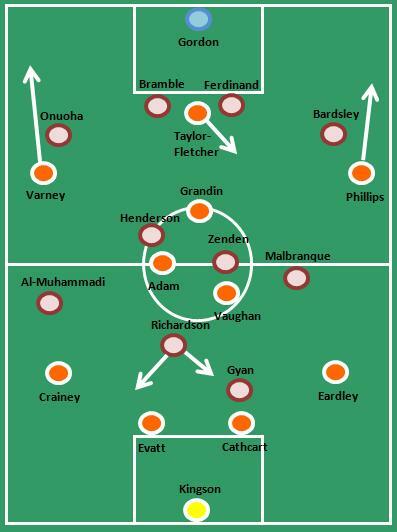 The compact nature of Blackpool’s formation might be a reflection of the fact that after initially having some joy in the game, they started to soak up some pressure and reverted to using the counter attack to break down West Brom. WBA stretched almost box to box, but leaving space between midfield and defence. Blackpool at this point had fallen behind and Matty Phillips (23) had been introduced for Elliot Grandin (14). Given that Grandin was the further player forward when he departed might have been a reason for his withdrawal from the game as well as his fitness level. Perhaps he was instructed to push higher up, but you’d have expected DJ Campbell to have been in his position. Perhaps DJ was dropping too deep at times? Below West Brom are starting to look more consistent as Mulumbu forms a line with his full backs, he sits as the rest of the team progress. Di Matteo has a clear definition of his team, 5 players with defensive duties and 5 with attacking duties which strikes a good balance on the pitch. 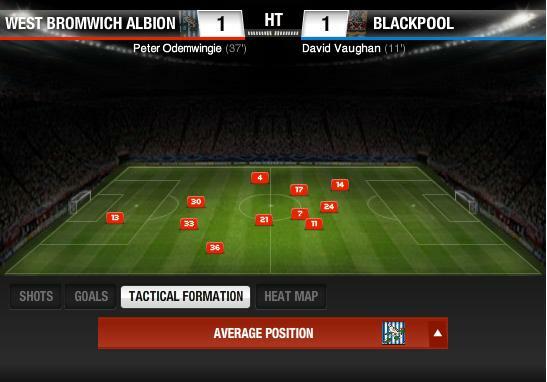 WBA start to have a nice separation between defence and attack as Mulumbu sits to cover his defence. By this point Ian Holloway had gone searching for the game and made brave attacking substitutions. David Vaughan (11) started to drop deep to afford the side some cover, Charlie Adam (26) now standing alone in midfield as DJ Campbell (39) and Taylor-Fletcher start to advance forward in search of the goal. Below West Brom are very orderly, which was important in the scheme of things as they haven’t necessarily been drawn in to Ian Holloway’s plan to throw attackers on the pitch to open the game up. Their defensive 5 have barely moved in all the second half. More of the same as Blackpool advance forward playing their attacking football, however, what is interesting to note between this shot and the opening shot on 31 mins is the defensive line. Check back and notice how Craig Cathcart (20) and Ian Evatt (6) are higher up the pitch. Look at the half time positions and see how Cathcart was on the ‘D’ of the penalty box. Would Cathcart have been caught out by Scharner’s clog had he been sitting deeper as earlier? Below West Brom remain steadfast in defence whilst all around them is attacking chaos. The key here is Mulumbu again, who has maintained his positional discipline since his opening half hour digression. Yes this was a great game for entertainment, Ian Holloway certainly did everything he could to win this. Blackpool did superbly to get back on level terms, but after making attacking substitutions it is hard to try to alter a teams mentality so late in the game. West Brom kept tight and kept their shape and saw off the best that Blackpool could throw at them and fittingly Peter Odemwingie kept his composure to close out the match. Blackpool went into this game hot on the heels of Wednesday night’s memorable victory over Liverpool, but could not overcome a West Brom side in a rut of five consecutive defeats. The two promoted sides produced a thoroughly entertaining game of football, which could easily have seen the number of goals run into double figures. It was by no means a masterclass in defending, but the neutrals will certainly have gone away happy. As for the Seasiders, this was a case of costly errors at both ends which ultimately resulted in leaving the Hawthorns empty-handed. Arguably the main culprit was DJ Campbell, who going into this match had been in sparkling form with five goals in his last five league outings. Crucial chances were missed at the start of both halves, with Campbell also spurning an opportunity for a late equaliser, with the resulting melee in the box going agonisingly wide. The chalkboard below highlights Campbell’s shots during the game. It is extremely uncommon for Campbell to squander so many chances inside the 18 yard box. This excellent piece from Tangerine Dreaming showed how all of Campbell’s goals last season in the Championship were scored from inside the area. Until recently, Campbell had not been afforded the luxury of chances from such close range, his first two Premier League goals coming from outside the box – against Newcastle and Aston Villa. However, Campbell’s rich vein of form had seen him presented with opportunities in his typical scoring areas, many of which he duly grabbed. His goals against Stoke, Sunderland, Birmingham and Liverpool had all been scored from close quarters, and he will be disappointed not to have added to his tally on Saturday. Could it be, however, that too much pressure had been brought to bear on Campbell? Before the match against Liverpool, the Seasiders had gone four league games with only Campbell getting on the scoresheet. Gary Taylor-Fletcher finally chipped in with an important equaliser and then followed this up with another equaliser at West Brom. The goals appeared to have dried up from Luke Varney though, and his performances too have not quite lived up to the standard he had set. 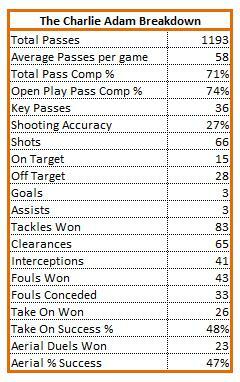 To compare, see the chalkboard below of his passes in the fixtures against the Baggies and their Black Country rivals, Wolves. Varney did admittedly only play 77 minutes at the Hawthorns, not the full 90 he did against Wolves, but even taking this into account the difference is significant. It is a pattern that is prevalent in many recent ‘Pool fixtures, and one not completely passing Holloway by as evidenced by his decision to substitute him in the last couple of games. Varney only made seven successful passes against West Brom, and only one in the second half before his eventual withdrawal. When Varney is taken off, it is typically Brett Ormerod who assumes his role on the left of the front three, but it is widely accepted now that Ormerod’s impact is unfortunately not what it once was. If proof were needed that reinforcements are required in the transfer window, this is surely it. This is not to cast Varney aside, but merely highlights that when he is not performing, or needs a rest, there is nobody at the moment who can satisfactorily replace him. The potential arrival of Adam Hammill would provide much needed competition in this area. I’ve chosen not to focus on the defensive performance, if only for the fact this blog post would be far too long. Needless to say, a few players had an off day, but when the back four have been performing so well all season, the odd poor performance can be excused. Craig Cathcart had barely put a foot wrong all season until Saturday, while Neal Eardley has been a revelation at right back. Knee-jerk reactions to these defensive lapses are unnecessary, and I don’t expect Ian Holloway will react with the same hysteria that some sections of the ‘Pool messageboards have. Blackpool now have a week until the next game, allowing Holloway to rest his players ahead of three consecutive home games. Four or more points from those will see ‘Pool bounce back in style.